There’s nothing wrong with traditional sight posts; they get the job done. But when I saw Blitzkrieg’s post shining luminescent green in that image, chevron pointing the way to what I hoped was a better sight picture, I knew I had to give it a try. It’s hard to see an AR “in the wild” these days without an optic and that makes perfectly good sense. Optics improve accuracy, speed of target acquisition and follow-up shots. Most of us, however, like the idea of having a backup plan in case our optic fails due to damage or a dead battery. I subscribe to the philosophy of having the best parts for my rifle that: one, work for me and what I use them for; and two, offer the best quality for what my budget can afford. My Chevron Front Sight Post arrived along with some other parts I’d ordered and I knew straight away after taking it out of the packaging that part two of my philosophy was fulfilled. Sometimes it’s difficult to assess quality in very small parts, but the thing looked and felt solid. All of Blitzkrieg’s Chevron Front Sight Posts are precision machined and threaded from one piece of billet 416 stainless steel. I’d chosen the luminescent green version with a Tritium dot. (If that version doesn’t do it for you, they also make versions in orange or white, with or without the Tritium). I also ordered their tool to help installation go smoothly. And smooth it was. Installation is no more than backing out your existing post and then screwing in the new one. I made a best guess on where to stop based on the height of the old post. I checked out the sight picture and knew before I’d fired a single shot that this was not only something different, but something that would work well for me. With that, I began looking forward to my next trip to the range. When I got to the range, I started from the bench at 25 yards and put a five-shot group together. With a few turns and a couple more groups, I was ready to take things out to 100 yards. I wouldn’t call myself an advanced shooter by any stretch of the imagination and even intermediate might be arguable. I also know my rifle can shoot far beyond my ability. With FMJ 55-grain practice ammo and little to no wind, I put together a few groups that were very respectable for me when I did my part. What a more experienced shooter could do with this post on their irons and better ammo would likely be very impressive. It wasn’t really the accuracy that impressed me though; it was the sight picture itself and my ability to make quick follow-up shots. 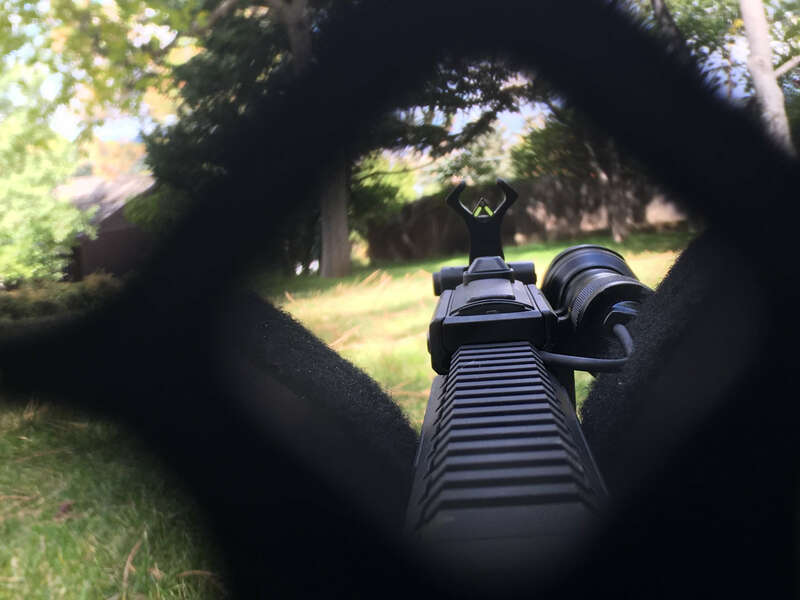 As I stared down the length of my AR, the chevron was literally pointing the way to the target, and not with a slim black post that can get lost in the background sometimes, but with a bright green pyramid. On the steel silhouette targets at 75-yards and some nearby circular tones at 100-yards, my follow-up shots felt fast and easy, regardless of my shooting position or level of support. Just like you’d find in many optics, the shape and color of the “reticle” helps guide you to your target. How much do I like Blitzkrieg Components AR-15 Chevron Front Sight Post? Enough that I actually shoot with my irons a lot – not only because it’s a good skill to practice, but also because it’s fun, accurate, and this post has a lot to do with both those things. At nearly $69, it may seem a little pricey. But when you stop to consider what you’re getting – the quality and Tritium not being the cheapest thing around – it’s worth it. If the chevron isn’t your cup of tea, they also make more traditional straight posts (flat and spiked) with all the various options I’ve mentioned which are less expensive and quite a bit less without the Tritium dot. They’ve even got plain Jane posts – both standard and slim – if that’s what suits you. 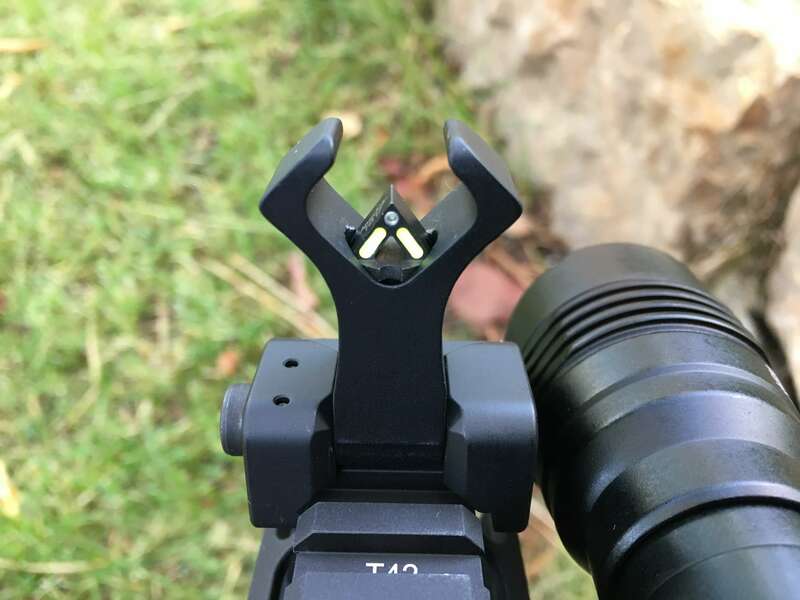 If you’re looking for a simple, yet highly-effective upgrade to your setup, the Blitzkrieg Components AR-15 Chevron Front Sight Post is definitely worth checking out. About the Author: Riley M.
Riley is a self-proclaimed “average Joe” who spends too much time and money (as if that were possible) on firearms and firearm accessories. He’s worked mostly in marketing and PR, but also had jobs in commercial real estate, auto sales, slinging coffee, and everything in between. He was born, raised and lives in “the Last Best Place,” also known as Montana. He has traveled the world and lived in Las Vegas and the United Kingdom. Some would consider Riley a newbie when it comes to the world of shooting, having only jumped in about 8 years ago, but he jumped in with both feet and is still swimming strong. When he isn’t at the range, you’ll find him enjoying all Montana has to offer with his wife and two small children.